Residents are seen outside their shanties in Navotas, Metro Manila, Philippines, Oct. 28, 2017. An U.N. report looked at the economic future of Asia, including poverty, which remains “relatively high” in South and Southwest Asia. A senior United Nations official says trade protectionism, rising private and corporate debt, and shortcomings in revenue raising are growing challenges to the economic outlook for the Asia Pacific. Shamshad Akhtar, executive secretary of the UN’s Economic and Social Commission for Asia and the Pacific (UNESCAP), noted the threats of trade wars undermining the region’s positive economic growth outlook. The United States has pressed states, notably China, to reduce trade and current account deficits with the U.S., recently imposing tariffs on steel exports from several countries. 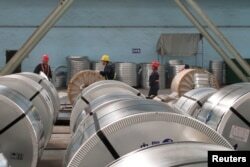 FILE - Workers pack cold rolled steel coil at a steel company in Zhangjiagang, Jiangsu province, China, April 27, 2018. Akhtar said such trade protectionism represents “quite a big threat” along with nontariff barriers, which have been rising since the 2008 global financial crisis, such as cross border restrictions that further limit trade. “If you look at the trends, there has been a post-2008 crisis, there has been an increase in nontariff barriers that face the Asia Pacific region as a whole. [The U.S. tariff increases] have been classified as a trade war eventually, if at all those [measures] are invoked there will be a counter reaction,” Akhtar said. She said a trade war would directly impact the region’s economic growth, especially affecting small- and medium-sized enterprises in the Asia Pacific that have trading links to economies such as China, a key target of the U.S. tariffs. “Yes, growth in itself would be impacted, and it’s happening at a time when we have just seen a recovery; both in terms of growth as well as trade,” Akhtar told VOA. She said the trade conflicts represented a challenge to the long-standing multilateral rules set down under the World Trade Organization (WTO). But economists with the Singapore/London based Capital Economics, say recent trade talks between the U.S. and China, and slowing global growth may have eased the threat of a trade war. Capital Economics Senior China economist, Julian Evans-Pritchard, in a May commentary, said that while the trade surplus with the U.S. remains near an all-time high, there were “some signs” of it leveling off. Evans-Pritchard said China’s export performance was also easing as global growth may have peaked. “This will hopefully encourage [China] to adopt a pragmatic approach to trade negotiations in order to try to avoid the imposition of tariffs and an even sharper slowdown in export growth,” he said. UNESCAP’s annual economic survey for the Asia Pacific, released this week, remained upbeat for the region’s economic growth at 5.5 percent in 2018 and 2019, with a “slight moderation” in China, offset by a recovery in India, with steady growth elsewhere in the region. But Akhtar said there are still significant economic headwinds going forward, including infrastructure financing, estimated to be as much as $1.7 trillion. To meet such demand, she said there is a need to reform taxation administration “in some of the Asia Pacific economies” through simplified tax regimes that could mobilize as much as $60 billion. Demonstrators are hit by police water cannon during a protest, organized by Punjab's main opposition party Shiromani Akali Dal, demanding debt waiver of farmers in Chandigarh, India, March 20, 2018. The survey warned of “potential financial vulnerabilities” in regions of high private and corporate debt, particularly in China, South Korea, Malaysia and Thailand, in order to avoid a repeat of the Asian financial crisis of 1997-1998. “It’s very clear to me we need to tackle the issue of private and corporate debt because from our previous experiences any overexposure in terms of whether the debt is private, corporate or household can induce a huge amount of domestic financial vulnerability,” Akhtar said. Akhtar noted progress achieved in reducing poverty from almost 44 percent in 1990 to around 12 percent in early 2010. Another issue is growing income inequalities in key economies, with the most marked changes in China and Indonesia, and to a lesser extent in India and Bangladesh. “Given that we have steep inequalities with countries, it basically means that people don’t have access to basic economic and social services,” which can also sustain poverty rates, she said. Akhtar said in the medium term “potential economic growth” appeared on a downward trend in several countries because of aging populations and a need to boost investment in human resources, such as education.